This little guy is tight, robust and feels solid in the hand. 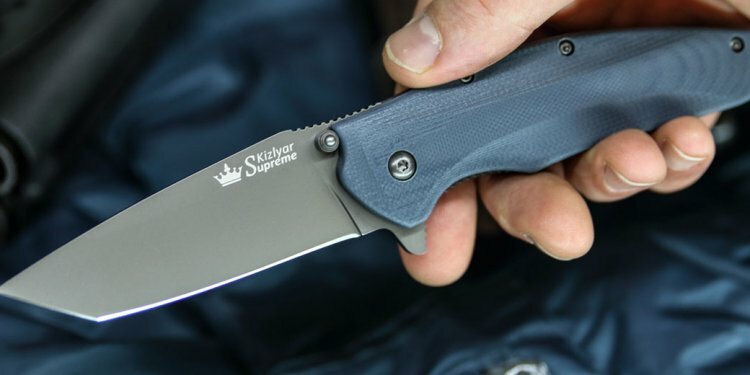 The blade is compact, but wide, and feels like you could cut a tree with it (if you had too), but it's a very short blade, so no worry of snapping. This knife has a very solid feel, almost as a fixed blade. The aluminum handle's finish does seem rubbery but is not easy to scratch off while the blade seems to be powder-coated & matte finished. Knife came reasonably sharp, needed some touching up, Bohler N690Co steel very hard & difficult to sharpen w/o a lot of work, stays sharp under use, though. Finish always draws attention & all who hold it mention its positive feel, although it may get a bit uncomfortable in very cold/hot weather. Overall assembly & fit very nice(should be for price). Excellent addition to collection. Bought 3 for Christmas present. Men were very happy. Comments included " has a good weight to it" . Engraving was a really nice touch. I would buy again. The knife was a gift for my brother in law for marrying me and my wife. The quality of the knife is amazing and the process of ordering it was easy. I was very proud of the gift. Thank you.